An online beta system, meant to replace archaic pen-and-paper, will be tested at select tagging stations during this month's turkey hunt. The first time that Wisconsin bowhunter Larry Bonde tagged a deer using his cellphone, his hunt suddenly became more enjoyable. Wisconsin is among a growing number of states that have opted for electronic tagging, allowing hunters since 2015 to record their harvests without going to a tagging station. 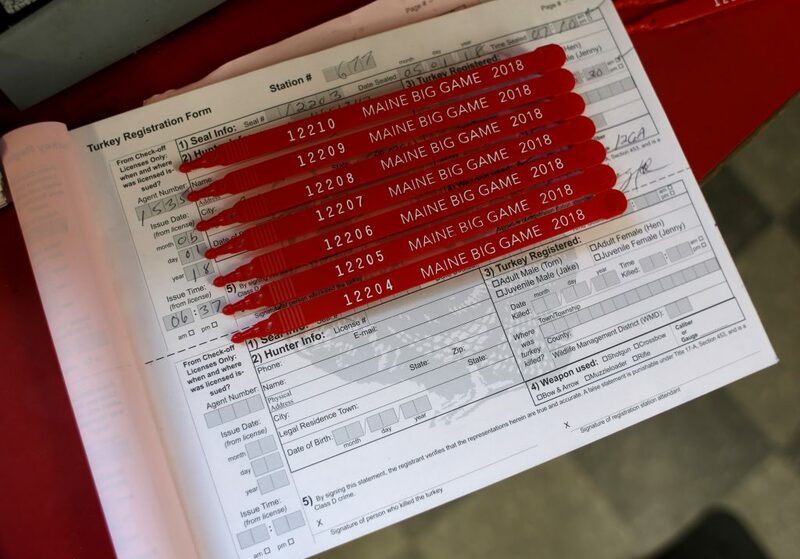 In Maine, the process of recording big-game harvests is still done the way it was a century ago – using pen and paper at 295 tagging stations across the state. That’s about to change, though somewhat gingerly. This month the Maine Department of Inland Fisheries & Wildlife will launch a beta test during the spring turkey hunt in which tagging stations will record harvests on computer software. Once fully implemented, the program will allow biologists to get real-time data on harvest numbers and a more immediate read on the health of the state’s moose, deer, bear and turkey populations. It also will enable Maine’s 170,000 licensed hunters to see state harvest maps before the end of the season. Maine Wildlife Division Director Judy Camuso said the beta test will be conducted at five Maine tagging stations during the last two weeks of the turkey hunt, which started last week and runs to June 2. The plan is to then train vendors at the other 290 tagging stations around the state this summer, and then roll out the new system for the black bear season starting Aug. 26. It also would be employed for the deer and moose hunts in the fall. Tagging stations, or game-inspection stations, can be found in all of the state’s 29 Wildlife Management Districts and all 16 counties. They have been used in Maine since 1919. A tagging station can be found at a variety of businesses, such as a general store, a gas station, trading post or hardware store. Hunters pay a tagging fee of $5 for moose, deer and bear or $2 for wild turkey. The tagging station keeps $2 of the fee. The harvests are recorded in registration books sent to tagging stations from DIF&W. At the end of each hunting season, the stations mail the books back to the department. DIF&W spokesman Mark Latti said it can take up to two months for the books to be obtained by state biologists. Then the information from the registration books is entered into computer software. DIF&W has one full-time employee who handles the chore, Latti said, supplemented by contracted data-entry workers. In 2016, there were 36,454 big-game harvests entered into the department’s system. The new computer system will speed up the process considerably. Tags will be received by state biologists and game wardens immediately. Biologists will know in real time where a particular hunter harvested an animal, and how many harvests there have been during a hunting season. Camuso said the computerized system is expected to be more accurate, because the information collected from hunters won’t be written down but entered directly into a computer system using drop-down menus that guide the vendors in filling out detailed information. “The only cost savings will be in the printing of the books, but it will provide high-quality data,” she said. Despite getting real-time harvest data, Camuso said wildlife biologists will not be able to determine annual allocations of moose or any-deer moose permits any earlier on the calendar. That’s because other factors, such as winter severity and mortality, play a role in their decision-making. Reaction is mixed at tagging stations about the new computer software. Some store owners said they had yet to be contacted by DIF&W about the plan. Dennis Beaulier is owner at the Ashland Gateway Variety Store, located at the crossroads between Presque Isle and the entrance to the North Maine Woods. His tagging station gets as many as 100 moose on a fall day. Beaulier said too many things could go wrong if tagging were to go away from the tried-and-true pen and paper. But Amy Haynes, manager at Scarborough’s First Stop Convenience, said a computerized entry system makes sense. Her tagging station gets as many as 20 deer on a busy day. Bonde, the hunter from Manitowoc, Wisconsin, enjoys not only the ease, but also the anonymity in electronic tagging. Before 2015, Bonde would go into his local bait shop and tag his deer in a logbook. Other hunters would be standing around and could see where he shot his deer and the size of the whitetail he recorded. “Now it’s just between me, and the landowner where I hunt, and Wisconsin,” Bonde said. The Wisconsin Natural Resources Department used to have more than 1,000 game-inspection stations. Now it has only 200 – as a convenience for hunters who do not have home computers or have poor cell service – and registration for deer is totally electronic. Hunters in Maine harvest 20,000 to 30,000 deer annually. In Wisconsin, hunters kill nearly 350,000 deer each year. The state needed a better way of collecting information, said Kevin Wallenfang, a Wisconsin big game ecologist. Wallenfang said it’s too soon to tell if there is significant cost savings with the online process. But he said compliance among hunters is at an all-time high. In 2017, deer-hunting compliance was about 90 percent during gun season and 94 percent for bow season, Wallenfang said. Maryland and Missouri are other states that have embraced technology to record hunting data. Deer and turkey hunters in Maryland must tag their game within 24 hours and can do so remotely via the internet, telephone or a mobile app. Missouri uses “e-permits” to tag deer and turkey using a mobile app. Several other states, including South Dakota, Utah and Nebraska, allow hunters to carry their hunting license on their smartphone. Starting this year, Nebraska allows turkey hunters to cancel their turkey tags using their cellphones. In Maine, some hunters are wary of embracing remote tagging for fear it could give rise to poaching. Others say it’s about time that Maine is moving toward recording harvests via computers at tagging stations. Wescott, the hunter from Windham, said the current system is outdated. But he’s not a fan of electronic tagging in the field. Adam Tibbitts of Berwick said having tagging stations input the information on a computer lets biologists get it more quickly, while still maintaining the culture of tagging stations. David Trahan, executive director of the Sportsman’s Alliance of Maine, said his group is going to introduce legislation that would allow hunters to tag remotely rather than going to tagging stations. “Phone tagging, calling on your phone, other states are doing that,” Trahan said. “This is a good start for the department, to get their feet wet. But we’ll be pushing for more. For now, DIF&W is moving ahead with its plans to get tagging stations up to speed with the computer software by the start of the bear hunt in August. But Camuso, the department’s wildlife director, notes that it has yet to hire anyone to help train folks at the tagging stations – and that five of the stations don’t have computer access.